WTF Is Trump Thinking - A Plum Post For A Prominent Opponent? On Friday, following the dramatic arrest of a prominent Trump supporter on charges of lying to Congress, President Trump gave one of the nation’s most sensitive national security and diplomatic posts to another controversial figure who already had been convicted of lying to Congress. Has the NeverTrump Republican echo chamber gone berserk over this irresponsible appointment? Have Mitt Romney and Marco Rubio taken to the Senate floor to speak out against the president’s defiance of honesty in government? Have they demanded hearings and a confirmation vote? Has House Speaker Nancy Pelosi warned that Trump’s action is so egregious it might call for an article of impeachment? Has Bill Kristol’s “Republicans for the Rule of Law” launched an ad blitz to protest Trump hiring an amoral convict? Not at all. Turns out, the appointee is one of the president’s worst enemies, a man forcefully opposed to almost all of Trump’s policies and campaign promises, a man who repeatedly has said Trump is morally unfit for his office. 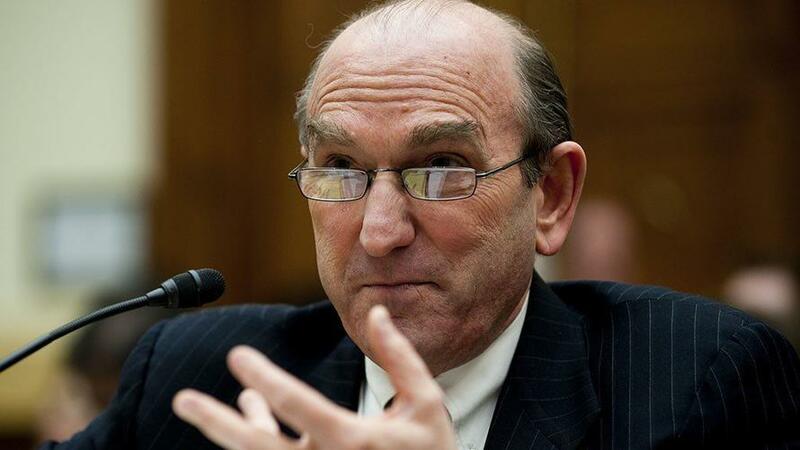 He is Elliott Abrams, the 71-year-old éminence grise of the NeverTrump movement. Abrams is the pre-eminent prophet and practitioner of hyper-interventionist approaches to destabilize or overthrow governments - of foes and friends alike - that do not pass his democracy-is-the-end-all-and-be-all litmus test. His closest friends and associates, from whom his political positions are indistinguishable, include some of President Trump’s most rabid enemies, false-flag “conservatives” Bill Kristol and Max Boot. Abrams, who had served in the Reagan State Department, faced multiple felony charges for lying to Congress and defying U.S. law in his role as a mastermind of the Iran-Contra debacle. Abrams’ dishonesty almost destroyed Ronald Reagan’s presidency and put Reagan in jeopardy of impeachment. Abrams was allowed to plead guilty to two reduced charges and later was pardoned by George H.W. Bush, who feared impeachment because of his own role in Iran-Contra. After having expressed antagonism towards nation-building during the 2000 campaign, newly elected President George W. Bush appointed Abrams as deputy national security adviser, where Abrams’ role was essentially nation builder-in-chief. Abrams was even more consequential as nation-wrecker. He was one of the principal architects of the invasion of Iraq. He is an inveterate advocate of “regime change” against countries whose policies he doesn’t like. He has a track record in attempting to overthrow foreign governments both by covert action and outright military invasion. At the beginning of the Trump administration, foreign policy establishment types lobbied clueless Secretary of State Rex Tillerson to accept the convicted criminal Abrams as deputy head of the department - the person running all day-to-day affairs at State. Trump, who would have had to sign off on the nomination, rejected Abrams when he learned of Abrams’ background. The truth about Abrams, while not by any means a secret, came to Trump’s attention from Senator Rand Paul (R-Ky.). Paul, who held a deciding vote in the Senate Foreign Relations Committee, said he would block Abrams if he were nominated. Nothing about Abrams, the NeverTrumper who believes Trump cannot govern effectively without him, has changed since then. Following his rejection by Trump, Abrams wrote a sour-grapes article for Politico, disparaging the president, along with Vice President Pence and Abrams’ erstwhile patron Tillerson, for not having international human rights policies identical to Abrams’ own views. Abrams has been outspoken against sensitive Trump international policies right up to the moment of his surprise appointment. He is unapologetic about his role in masterminding the Iraq war. He has opposed Trump concerning American troops in Syria and America’s relationship with Saudi Arabia. As recently as January 14, 2019, he published a withering attack on Trump’s Middle East policies and diplomacy. As events in Venezuela last week reached a crisis with rival claimants to the nation’s presidency, Abrams suddenly appeared deus ex machina at the side of Secretary of State Mike Pompeo, who said in a news conference that Abrams was appointed, “effective immediately” as special envoy to deal with resolution of the situation in Venezuela in a way that supposedly would advance U.S. interests. Immediately? An appointee to a sensitive post needs a background investigation and security clearance. These investigations can take months. If he indeed has a valid clearance, that means his appointment was decided long ago. Abrams’ special envoy post will be far more powerful than that of an ordinary ambassador or assistant secretary of state—offices that require Senate confirmation. Should the Senate acquiesce in letting Abrams work without Senate confirmation? What is Pompeo thinking? Has Pompeo read Abrams’ anti-Trump articles? In particular, has he read Abrams’ January 14 anti-Trump article that mocks Pompeo with a hugely unflattering photo of the secretary of state? Abrams is a close friend and constant collaborator of Bill Kristol and Max Boot, both of whom are waging campaigns to impeach Trump or deny him re-election. There are no—repeat, no—policy differences between Abrams, Kristol, and Boot. If the appointment is supposed to be a sharp move to “hug your friends close and your enemies closer,” then the test of its efficacy would be that Kristol, Boot, Jonah Goldberg, David French et. al., would halt their anti-Trump campaigns. One would think that if the Abrams appointment is one side of a shrewdly calculated transaction, then silencing Team Kristol would be a necessary condition. So far there are no signs of this. What did Trump know about the new Abrams appointment, and when did he know it?